Description: 4-8-4 Reading T1 crossing Overpeck Creek. Description: American Freedom Train 1 taking on fuel on the ICG at Kankakee, Illinois on July 27, 1975, Kodachrome by Chuck Zeiler. Description: American Freedom Train 1 somewhere on the south side of Chicago, Illinois on July 27, 1975, Ektachrome by Chuck Zeiler. The AFT was routed over several connecting lines to get from the ICG to the C&NW for forwarding to Navy Pier. Description: American Freedom Train 1 somewhere on the south side of Chicago, Illinois on July 27, 1975, Ektachrome by Chuck Zeiler. That's my friend Chris Burritt rolling 16mm film as the AFT makes its way into Chicago for display. Alas, Chris passed away in 2008, and I do not know what happened to his film. Description: American Freedom Train 1 at about Lake Street and Cicero Avenue in Chicago, Illinois on July 27, 1975, Ektachrome by Chuck Zeiler. The AFT was routed over the Belt Railway of Chicago to get from the ICG to the C&NW. It is seen here passing under the CTA's Lake Street elevated and is almost at the C&NW's 40th Street yard. The cutoff at the left is the result of my pushing a 36 exposure roll of film to 37. You know I prayed for a CTA train to pass over during this. Description: American Freedom Train 1 chugging somewhere between Kankakee and Chicago, Illinois on July 27, 1975, Ektachrome by Chuck Zeiler. Nice clean stack, good fireman. Description: Citizens greet the Bicentennial American Freedom Train 1 somewhere on the south side of Chicago, Illinois on July 27, 1975, Ektachrome by Chuck Zeiler. The train is working its way north to a connection with the C&NW where it will be turned and put on display for a couple of days at Navy Pier. Description: American Freedom Train 1 arriving in Kankakee, Illinois on July 27, 1975, Kodachrome by Chuck Zeiler. There must have been a dozen or so photographers standing around me, where the heck are their photos? There are even a couple of folks right up by the drivers. Description: American Freedom Train 1 at about Lake Street and Cicero Avenue in Chicago, Illinois on July 27, 1975, Ektachrome by Chuck Zeiler. The AFT was routed over the Belt Railway of Chicago to get from the ICG to the C&NW. It is seen here passing under the CTA's Lake Street elevated and is almost at the C&NW's 40th Street yard. I would have paid money to have the CTA park a couple of their bicentennial cars on the overpass for this occasion. Description: On July 27, 1975 The American Freedom Train had just arrived in the Chicago area. Upon arrival, it was first wyed (over greased rails at one point) and then hauled to Navy Pier for a few days of exhibition. This photo shows the train after it was turned but before being moved to Navy Pier. At this point the train was awaiting a C&NW switch engine to haul the train backward to Navy Pier. Due to light rails and clearance restrictions, the locomotive was left behind. As I understand it, the locomotive was moved somewhere near the Merchandise Mart for viewing. Description: American Freedom Train 1 arriving in Kankakee, Illinois on July 27, 1975, Kodachrome by Chuck Zeiler. 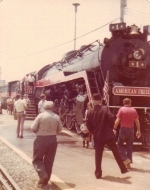 Description: American Freedom Train 1 taking on fuel, getting mechanical attention, and photo opportunity at Kankakee, Illinois on July 27, 1975, Ektachrome by Chuck Zeiler. Description: American Freedom Train 4-8-4 (ex-RDG 2101) 1 at Clinton Street in Chicago, Illinois on July 29, 1975, Kodachrome by J. H. Nixon, Chuck Zeiler collection. Due to clearance issues, light rails, and condition of the track, the locomotive was left at Clinton Street for display while the rest of the American Freedom Train was displayed at Navy Pier, about a half mile behind this location. Description: American Freedom Train 1 and 4449 on the C&NW at Proviso, Illinois on August 4, 1975, Ektachrome by Chuck Zeiler. The AFT arrived in Chicago on July 27 and was put on display at Navy Pier. 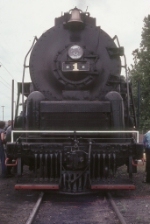 On August 4, the train was pulled from Navy Pier to Proviso, and the locomotives were exchanged in a brief ceremony. Obviously, I forgot my car and people filters. 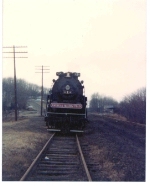 Description: Taken in 1976 from a 110 camera, The AFT was stationed here for a short while. Title: Distance shot of the American Freedom Train at the remains of old Birmingham Terminal Station . 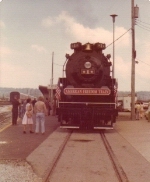 Description: Former Reading T-1 #2101 on the American Freedom Train at Dayton, OH. Date of photo approximate. Description: B&O freight passes the crowd waiting to go through the American Freedom Train exhibits. Date approximate.